One of Mgluaye's Pages' visitors, Obama requested to upload mp3 trimmer. So that, I'd uploaded this upon his request. 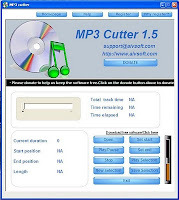 Software called MP3 Cutter 1.5 is a freeware, you can download from its original website here also. Its file size is about 7 MB, so we can say that a tiny software, you may need to select the interval that you want to cut. breakfast as a result of I discovered it for him.
. smile. So let me reword that: Thnx for the treat! individuals are not enough to talk on such topics. To the next.